Multi-millionaire businessman John Elliott leaves little doubt about his economic patriotism as his Jaguar car nears his factory in north-east England. "Look at this area, it once produced the world's first locomotive steam engine, and now the Japanese, Hitachi, are producing our trains," he says dismissively as he drives. 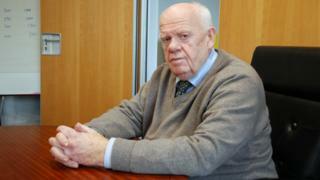 The straight-talking 73-year-old is the founder and boss of manufacturing business Ebac. Set up in 1972 to make dehumidifiers, in the past year it has also started producing the first British designed and built washing machine for 40 years. Ebac is based in the County Durham town of Newtown Aycliffe, just a few miles from where Mr Elliott was born, and he has ensured that it will remain that way - in perpetuity. Instead of his two daughters inheriting the business and his 70m fortune when he dies, in 2012 he handed ownership of the company over to a trust, the Ebac Foundation. "The trust means the company can never be sold," says Mr Elliott. "I never felt it was mine to sell." Under the trust arrangement, Ebac must maintain all work in Newtown Aycliffe, and any surplus profits are used to help community groups, such as the local football club. Mr Elliott, who still leads the company, and is one of the foundation's four current trustees, says that his children, who both work for the business, are happy with the arrangement. He adds that he was particularly determined to ensure that Ebac could never be moved abroad. "We could make more money if we started to make our products in Poland," he says. "But, personally, I would rather make a smaller profit and assist the UK economy than make a bigger profit and devalue the UK economy." With more than 200 members of staff, Ebac is a sizable employer in an economically deprived area, but Mr Elliott's opinions about his workforce may raise some eyebrows. "They are not very ambitious but they're not second-class citizens, and there are a lot of them in the UK," he says. "They are reasonably well motivated, but they're at a low skill level." Mr Elliott, who was against the introduction of the minimum wage because he views it as a brake on productivity, says it is wrong for generations of UK politicians to think that everyone should do well in school and get lots of qualifications. "The wrong idea was that we should make everyone in Britain very, very clever so we wouldn't need to do any hard work," he says. 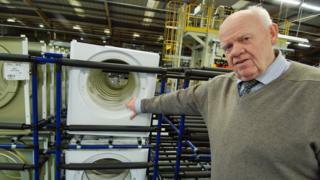 "[Instead], half the people in the UK - or thereabouts - want to work in factories like this," he says. "It's their choice, they're not here by force. If they would rather do an unskilled or semi-skilled job at a lower rate of pay then that's their preference." He adds that while the UK still has a manufacturing industry it can be proud of, he is disappointed that so much of it is now in foreign hands. Mr Elliott himself left school at 15 with no qualifications. Looking back on this, he says: "My biggest regret? Two wasted years - I should have left at 13." Born and raised in a coal mining village near Bishop Auckland, County Durham, Mr Elliott and his two brothers were brought up by their mother and grandparents after his father died when he was six months old. After leaving school he became an electrical engineering apprentice, going on to work for a number of local companies. His big break came in 1972 when he was 29, a client asked him to design an industrial humidifier and he set up his own company to make it. And thus Ebac [then known as Elliott Brothers Air Control] was born. 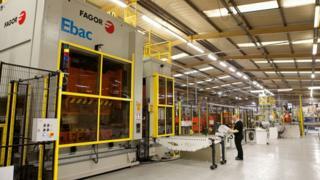 Ebac has grown over the years, and today also makes water coolers and air-conditioning systems. Its annual turnover is more than 15m, with profits exceeding 3m. A keen supporter of Brexit - the UK leaving the European Union - Mr Elliott says it is a massive opportunity for the country, which the UK should embrace. "Currently we sell to France and we sell to the US," he says. "The US has tariffs and that's an inconvenience, but it's not a deal breaker. "The way you sell stuff is to come up with things people want to buy. "People imagine the UK won't be able to sell anything anymore to Europe. No, no, no. The rest of the world trades with Europe, you just have to deal with tariffs." Emma Roberts, head of industrial strategy at the CBI business lobby group, says it is pleasing that Ebac is focusing on "making a success of Brexit". 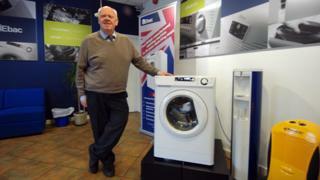 While Ebac's washing machines are currently only available at just 20 outlets in north-east England, Mr Elliott has plans to increase production. 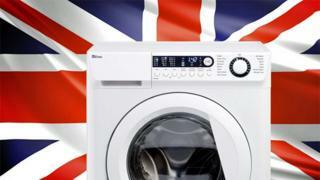 He says that its 10m washing machine assembly line could produce more than 250,000 made in the UK washing machines per year.